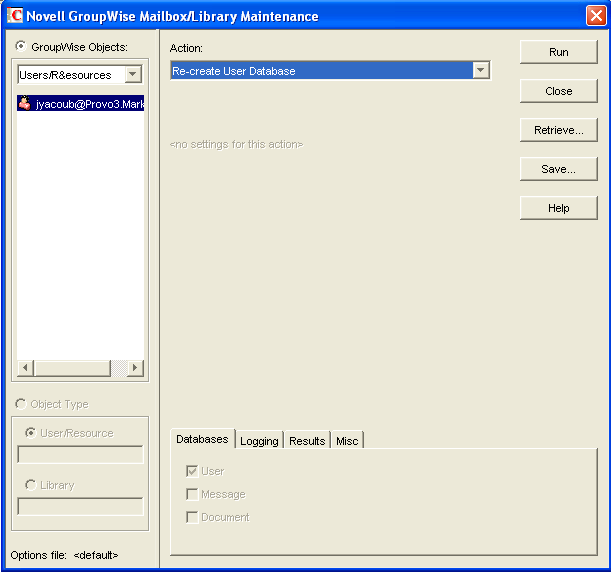 The Re-create User Database option of Mailbox/Library Maintenance rebuilds a user or resource database (userxxx.db) and recovers any information it can. Some information is lost, such as the folder assignments. You should never need to select this option for regular database maintenance. It is designed for severe problems, such as replacing a user database that has been accidentally deleted and for which you have no backup copy. A substantial amount of information is lost in the re-creation process, as listed in User Databases. Because folder assignments are lost, all items are placed into the Cabinet folder. The user must then reorganize all the items in his or her mailbox. Using filters and searching can facilitate this process, but it is not a desirable experience. It is, however, preferable to losing everything. In ConsoleOne, browse to and select one or more User or Resource objects that need the user database re-created. Click Tools > GroupWise Utilities > Mailbox/Library Maintenance. From the Action drop-down list, select Re-create User Database. Selected options can be saved for repeated use. See Saving Mailbox/Library Maintenance Options. Click Run to re-create the user database.